Taim na rid yu op! Ai nou get in chon emo sleng ai na lan op, nami? Nou get yu daun, ai na ste kamp raun Gonasleng. Also to all of you who can read some Trigedasleng, if I got the top part all wrong, sorry. Yet another months has passed by, where does time go? It feels like I was writing one of these just the other day. Back on track, time has passed since the last one of these updates which means that some kind of progress has hopefully been made. So lets get started! SpatialOS finally got Unity 2018 support, therefor we spent some time to move the project from the old SpatialOS SDK to the new SpatialOS Unity SDK. We also upgraded all working projects to Unity 2018. While we are still in early in development its important we stay up to date. At some point we will reach a point where we no longer can do larger engine and sdk upgrades and will need to lock down our current versions. Therefor while we can we try to update as often as possible, while we still can. Again? Is it really not done yet? No its not, but its getting there! I'm hoping to make the inventory flexible enough, not just to fit Project Arkadia, but pretty much any project. 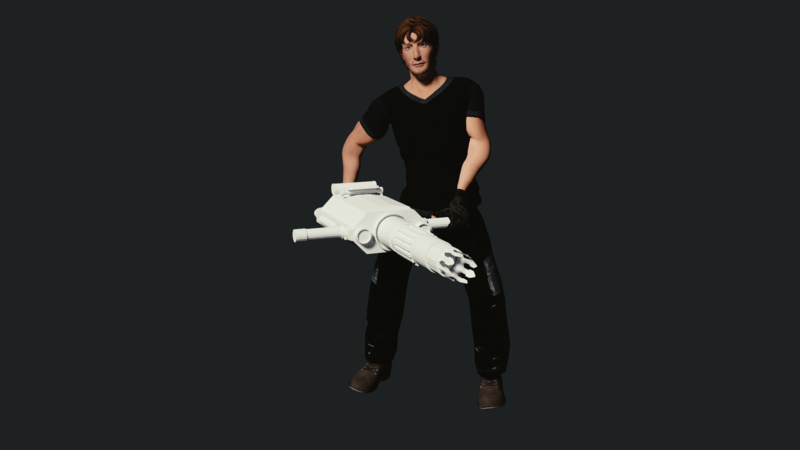 The current plan is to sell it on the unity asset store to fund the project (and fund my wallet as its a lot of work). The Inventory System is a whole mini-game in it self. Its grid and container based, so you can (if you want to) micro-manage how your inventory looks and where your items are. This has proven to be quite a challenge. Items takes up a specific amount of slots in both the x & y axis. Some items will be stack-able, but other than that no 2 items can take up the same slot. You are able to swap items around in your inventory, but you can't place an item if there is not enough space, but you can swap 2 items of different sizes given that both items are small enough to fit into their new slot. In your inventory items can only be stored inside of 'containers'. A container can be a backpack, clothing item, or a weapon holder (like a gun-holster or arrow quiver). You can't have more than 1 of the same container type (So no wearing 2 jackets and 8 pairs of pants). If you drop a container on the ground all items inside the container will be dropped as well. If you pickup a container from the ground, it will contain all the items that was previously inside of it. 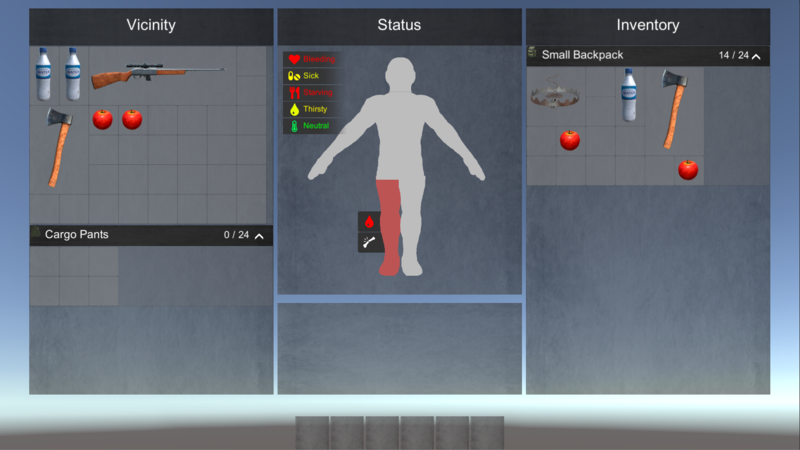 In the 'Vicinity' window, items around the player will be shown. If you move around the window will automatically update to hide items that are to far away or to show new items that are now within reach. You will also be able to see 'containers' and the items inside of them, so that you can ex. take food out of a backpack without taking the whole backpack. There is still a lot of work to be done. Works also went into the testing Mount weathers acid fog and how it spreads across the map. It is also a very early preview and was done to do performance testing. You will be able to chop-down trees, gather sticks, farm lands and hunt animals in-game. Therefor its only fair that you should be able to pulverize large rocks with pulsing sound-waves, with what looks like the Eligius Mining Drill! ..... Or maybe you won't be able to.